"Parturient montes, nascetur ridiculus mus. The mountains are in labor, and a silly mouse will be born." Well said, Horace, in your "Epistles, Book Two," but times have changed. Actually it's a Bosavi woolly rat, the world's largest (32" long, 3 lbs. ), one of 40 new species found by the first scientists to enter Mt. Bosavi, the huge collapsed cone of an extinct volcano in the southern highlands of Papua New Guinea. Other new critters recently found along with the mild-mannered vegetarian rat: a frog with fangs, a new bat, and the Henamo grunter, a fish that makes grunting noises using his swim bladder. Naturalists and scientists around the world were stunned by the news of so many newly discovered species, made public last month by the BBC, but probably not Vojtech Novotny, a Czech biologist who has studied the infinite number of insects that populate the 20,000 plant species found on New Guinea for more than ten years. 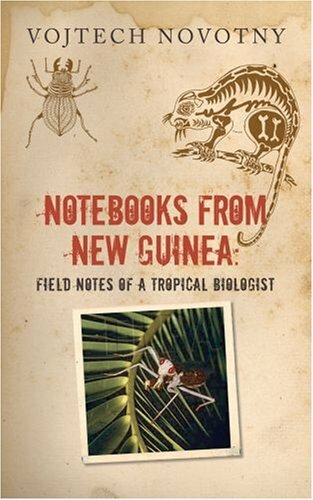 While Novotny's drolly written "Notebooks From New Guinea" tells us very little about bugs and plants, he imparts a mountain of fascinations about the people, customs, and way of life on the still mysterious second-largest island in the world. (Proper usage note: the island is New Guinea, the country Papua New Guinea). In the global village New Guinea might as well be on another planet. Although peoples have inhabited New Guinea for 50,000 years, not until 1876 did the first white man penetrate the island's interior. Only in 1930 did explorers find the one million people living in the highlands, the last first contact between two great civilizations in our history. And what remarkable people! Karimui men black their bodies with charcoal, then draw on their own white skeletons for festivals. The Onabasulu not only count on fingers but, starting with the right foot toe, use other parts up and down the body (the nose, number 17, is the prime number, being centered, favoring neither right or left) until reaching 33, the basis of their numerical system. Many of the 800 tribes speaking 1/6th of the world's languages never have used money or calendars, much less clocks. There is the wet and dry season, and since they are cyclical, why worry with dates. Or history for that matter. Novotny reminds us throughout how recent our history has impacted Papua New Guinea: there still is no road connecting the capital, Port Moresby, in the south with northern towns. The oldest building? A white-painted plank-walled church built in 1890. There is no working cinema in the country, but you can visit the Czech Embassy outside the capital where no doubt you'll notice some walls are papered floor to ceiling with beer mats. Some of Novotny's most amusing passages occur when he contrasts New Guinean customs with those of his native Czech Republic. You Czechs actually abandon your dead to putrescent decomposition by maggots and worms instead of eating them, an act of reverence as well as the way to assume their physical and mental powers? Outrageous! One reason New Guinea remains mysterious and unknown is that it's hardly an easy or comfortable travel destination. Crocodiles and large snakes, of course, but also peculiarities like the dangerous landings at Madang's airport thanks to flying foxes. And there's the rampant malaria. In ten "Malaria Intermezzo" boxed texts, Novotny diaries his frequent bouts and aftermaths the past ten years. The occasional calm observation like "Nails coming away from your toes are the first sign that your battle for healthy feet is being lost" and you get the idea. I'm surprised the author/field biologist didn't mention New Guinea has the largest butterflies and beetles in the world; more than 700 species of birds, five times more fish species than the Caribbean, and that nowhere else is rugby the national sport. Or that elders who remember past cannibalistic times describe human flesh as tasting like young cassowary. These factoids I gleaned from Michael Moran's superb "Beyond the Coral Sea" and Paul Raffaele's "Among the Cannibals." That said, however, "Notebooks From New Guinea" is wonderful armchair travel limning that part of the South Pacific much stranger than that of Somerset Maugham's Miss Thompson, Joseph Conrad, Gauguin and Robert Louis Stevenson, oleander, silk, cheroots, and Tiger Balm.